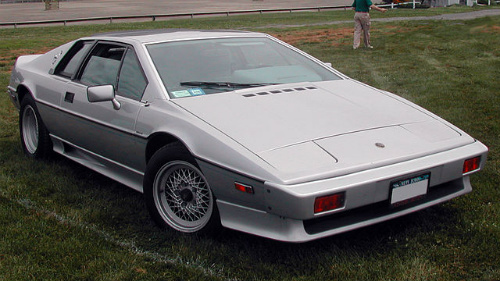 The Lotus Esprit Turbo HCPI sports car was launched at the Geneva Motor Show In March 1986, and was aimed primarily at the US market. It was the first Lotus to incorporate fuel injection (PI) in the form of the Bosch K-Jetronic system. It was a high compression (HC) variant, with the compression ratio increased from 7.5:1 to 8.0:1 by using different pistons, and an increase in the maximum boost pressure from 8psi to 9.5psi. Fitted with an exhaust catalytic converter, it was powered by the 2174 cc, 16 valve, twin overhead cam, Lotus 910 engine, which developed 215 bhp at 6250 rpm, and 202 ft/lbs of torque. The cockpit area was increased, the seats were widened and lowered, and the footwell region was made larger. The engine developed more power and torque, there was a new front spoiler, a larger radiator intake, and "HCPI" logos were added. In October 1986, the Lotus Esprit Turbo HC was launched at the Earls Court Motor Show in London, and was targeted at all markets except the US. It was fitted with the same high compression cylinder head as the HCPI model, but used two twin choke Dell'Orto DHLA45M carburetters instead of fuel injection, and was not equipped with a catalytic converter. It developed 215 bhp at 6250 rpm, and 220 ft/lbs of torque at 4250 rpm. However, even when travelling at only 2500 rpm, some 190 ft/lbs of torque was available, giving the car a degree of relaxed flexibility. Like the PI variant, it was given the uprated cooling system and adjustable rake seats. The fast that the torque was 10 % greater than earlier versions of the Turbo created a small increase in performance. Other notable changes to the engine included a new manifold designed to increase the flow of gas, and a different AiResearch Garrett T3 turbocharger casing. Although the maximum speed was unchanged, there was an increase in mid range acceleration. It had a 0-60 mph time of 5.3 secs, a 0-100 mph time of 14.6 secs, a standing 1/4 mile time of 14.1 secs, and an overall fuel consumption of 24.2 mpg. The chassis was covered by an eight year anti corrosion warranty, as was the previous model. Production figures for the HCPI variant were: 246 units in 1986, and 198 units in 1987. Response from the steering was excellent, and the car handled like a go-kart. However, because the front coil springs were stiffened, it meant that, after a time, driving could become tiring. In visual terms, it was regarded as a rival to a Ferrari or Lamborroghini. On the other hand, in terms of mechanical refinement and practicality, it fell well short. However, by now, there were a number of cars with a more competitive price tag that were able to offer performance on a par with the Turbo Esprit. In Autumn 1987, it was replaced by the Esprit X180 sports car, with a styling that was more rounded than its predecessor. A 1986-87 Lotus Esprit Turbo HC in good condition would fetch in the region of £15,000/$25,000.